I founded Black Gate in 2000, and we published the first issue at the World Fantasy Convention in Corpus Christi, Texas in October of that year. We produced the print magazine for 11 years (the last issue, #15, was published in May 2011), and during that decade-plus I was keenly observant of other print magazines, especially new ones. A handful of new zines popped up during that period, but I think my favorite was William Schafer’s Subterranean magazine, which produced eight print issues between 2005-2011 before transitioning online. I only managed to come across a handful of issues during the print era, but that’s okay. I keep an eye out for back issues at conventions, and occasionally snag one or two (as I did with Subterranean #2 at the 2015 Windy City Pulp & Paper convention). They’re hard to come by, but they’re generally not expensive. I have an eBay saved search that alerts me when new lots are listed, and a few months ago I got a ping about the set of three issues above. They were in pristine, unread condition, and offered for $16 total. I was the only bidder, and took the whole set home for less than the original cover price. It’s lonely being an obsessive magazine collector, but sometimes it has its benefits. Fiction mags are natural incubators for emerging talent. The hot writers of today were earning their chops in fiction magazines a decade ago, and flipping through the pages of these issues reveals fiction by John Scalzi, Rachel Swirsky, Ann Leckie, Jo Walton, Elizabeth Bear, Cherie Priest, and many other writers who’ve gone on to great things. William Schafer was (and is) the publisher of Subterranean Press, one of the most successful and prolific genre small presses. Subterranean Press has produced hundreds of books over the past few decades, and as a result Bill Schafer is one of the most well-connected editors in the field. I’m not at all sure what the genesis of Subterranean magazine was, but it wouldn’t surprise me at all if it was a combination marketing engine/house organ/showcase for Subterranean writers. Whatever the case, the magazine published some great fiction, and was very professionally designed and laid out. About a year ago, SF novelist and friend John Scalzi pitched an anthology idea to me, one themed around science fiction clichés. You know, those ideas like sentient computers and Amazon women on the moon that are so been there done in the field that even the souvenir t-shirt doesn’t fit any more. The idea didn’t strike me as ideal for an anthology, but for a 60,000 word magazine issue…. well, here we are. I’ll let John run with the clichés through the story introductions and his Editor’s Afterword. Me, after giving the stories a test run, I’m pretty happy to say there’s life in them clichés. Issue #4 has an extremely impressive TOC, with contributions from Rachel Swirsky, Scott Westerfeld, Allen Steele, Chris Roberson, Elizabeth Bear, and many more. This issue was edited by John Scalzi and published in 2006. It is 88 pages, with a cover price of $6. The cover and interior illustrations are by Bob Eggleton. Issue #6 was edited by William Schafer and published in January 2007. It is 88 pages, priced at $6. The cover is by Edward Miller. Issue #8, the final print issue, was published after a four year delay in 2011. It includes a big novella by Tim Lebbon and an Old Man’s War story by John Scalzi, plus fiction from my friend Andy Heidel, who sent me the very first review copies I ever received waaaay back in the summer of 1997, when he was the PR rep for Avon Eos. Here’s the TOC. Issue #8 was edited by William Schafer and published in October 2011. It is 88 pages, priced at $6. The cover was by Edward Miller. If you’re interested in print copies of Subterranean, they can be a little tricky to come by, but they’re well worth tracking down. The eight print issues frequently show up in online auction sites like eBay; expect to pay around $10 for copies in good condition. Keep your eye out for discount lots with multiple issues. Your best bet might be to try the online issues, all of which are still available on the Subterranean website. 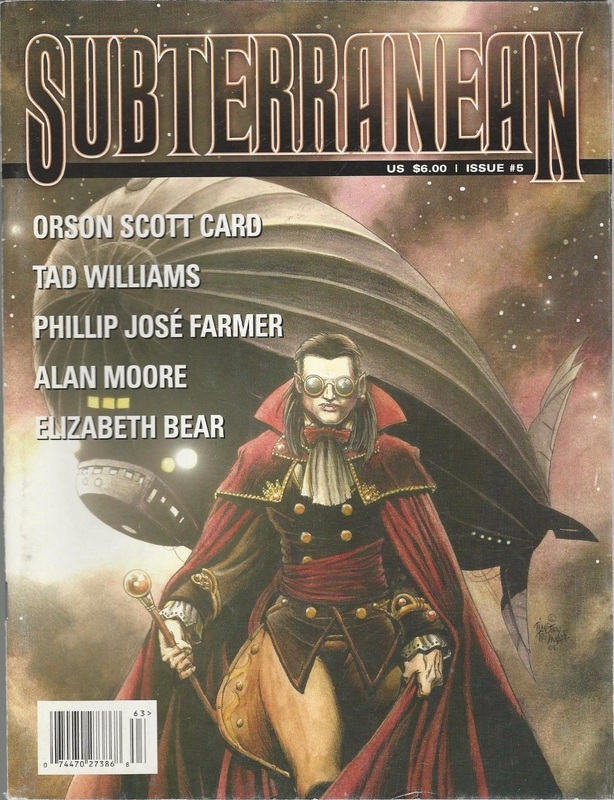 If you’ve got your heart set on print, check out The Best of Subterranean, a 752-page hardcover collecting dozens of the best stories from both the print and digital incarnations. It was published by Subterranean Press in July of 2017; cover price is $45, and copies are still available. 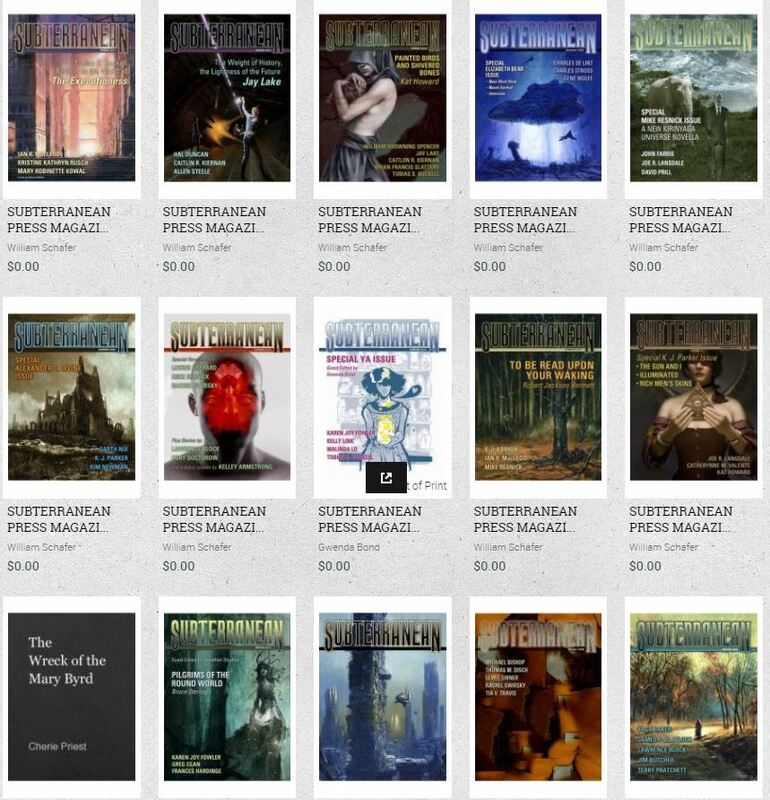 I have no insight into what the business rationale for this might be, other than to guess the magazine wasn’t sufficiently profitable and that perhaps the on-line version is intended as a way to get readers to visit the site regularly and possibly in a frame of mind to order the somewhat pricey limited edition books from parent Subterranean Press. What you get on the website is strictly text, no illustrations (though the magazine was never heavily illustrated) and no advertising. The stories are mostly “short-shorts,” though there are longer ones published in installments (as I write this, all twelve parts of the Lucius Shepard novella, “Vacancy” are up, and the first chapter of “The Surgeon’s Tale” by Jeff VanderMeer and Cat Rambo has been posted). Subterranean maintained a fairly rigorous quarterly schedule for nearly seven years, producing some 31 online issues. Here’s the complete catalog. 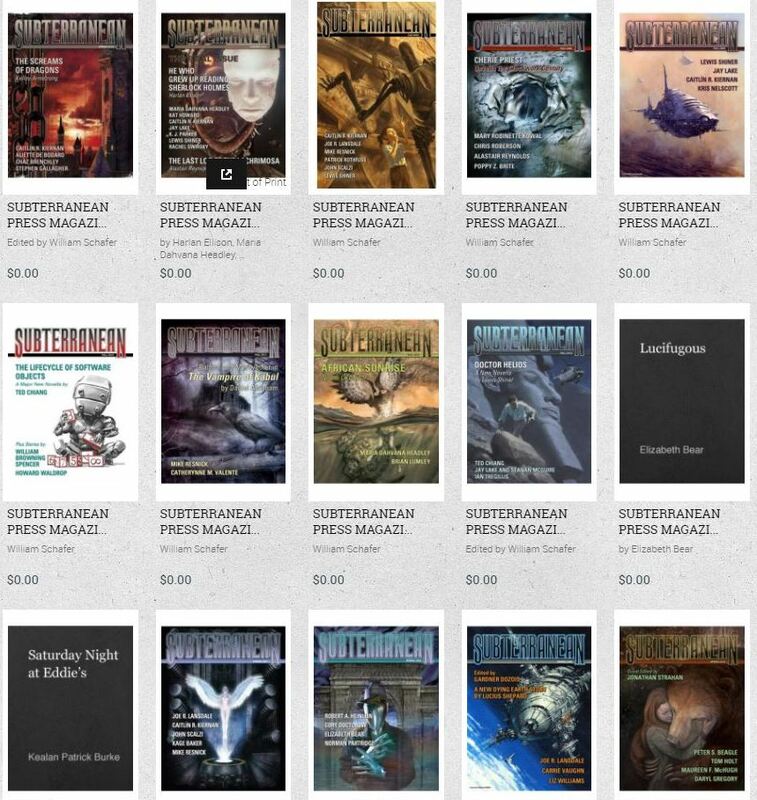 Click the images above to be taken to the Subterranean Press website, where digital issues are free and still available. Some issues are also downloadable in epub and mobi formats. See our late November Fantasy Magazine Rack here, and all of our recent Magazine coverage here. Ann Leckie’s story, “Hesperia and Glory”, in Scalzi’s special issue, was her first published story. > Ann Leckie’s story, “Hesperia and Glory”, in Scalzi’s special issue, was her first published story. You should be… good eye! > At the time I had no idea that she was almost my neighbor and that our kids went to the same high school. !! When did you find that out?? I think that not too long after that, so in 2008 or so, I made a post on my then blog about seeing an opera at Opera Theater of St. Louis (which is walking distance from my house), and Ann saw it and said she’d been to the same opera. At Sasquan she and Mary Ann spent time talking about their common room mother experiences.